Providing maximum comfort, safety, and well-being while you stand, WellnessMats are advocated by healthcare professionals and are medically proven to promote proper circulation and reduce fatigue. WellnessMats are the mat of choice for all types of professions and can also be enjoyed at home in a variety of colors, patterns, and sizes. Made from Advanced Polyurethane Technology (APT), this mat is non-toxic with no plasticizers, no odors, and no leeching chemicals. Providing rejuvenating relief for your feet, knees, and back, WellnessMats are incredibly soft yet durable. This proprietary technology ensures that WellnessMats will remain buoyant, resilient, and provide optimal comfort and support for years. With gradual edges that will never curl and will always lay flat to prevent tripping, this mat is inherently anti-microbial, puncture resistant, shock resistant, stain resistant and heat resistant up to 400 degrees Fahrenheit. WellnessMats proudly backs each mat with a 20 year manufacturer's warranty against any defects in materials and workmanship. This 20 year manufacturer's warranty includes a seven year performance warranty to ensure that each mat will remain unmatched in comfort, always lie flat, never delaminate, and never compress. Made in the USA, the WellnessMats are a comfortable and stylish way to suspend body weight and increase blood flow to the extremities. 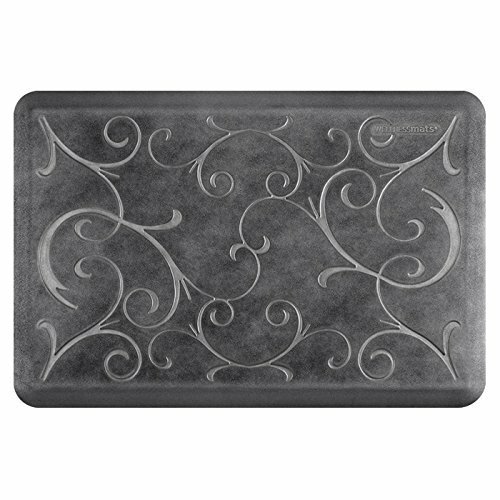 This mat is part of the Estates Collection and is a sophisticated blend of traditional and contemporary design. Made with a layering of colors, the Onyx color features a Black mat with a Burnished Nickel top color finish. The Burnished Nickel color is made with a burnishing process that creates a matte finish for a subtle shimmer. As part of the Essential Series, this nickel helps to capture the elegance of soft metallics that are certain to reflect affluent standards of living.